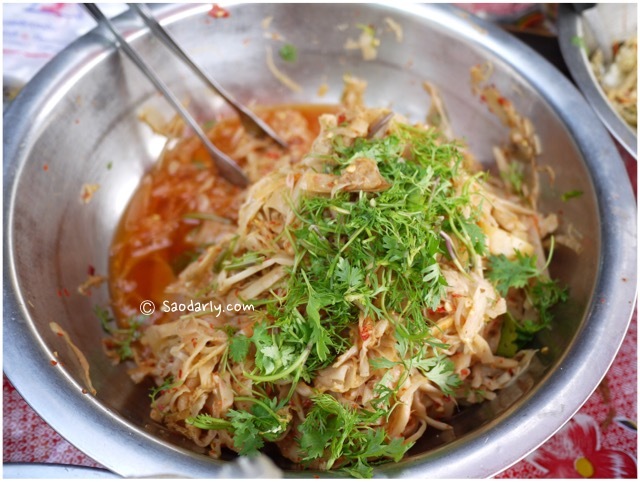 Jeow Nor Mai Som ແຈ່ວໜໍ່ໄມ້ສົ້ມ (Spicy Sour Bamboo Shoot Dipping Sauce) at the Morning Market in Luang Prabang, Laos. I was walking around and looking for something to eat for breakfast when I saw a food stand selling a few types of Jeow (Dipping Sauce) next to a grilled food stall. 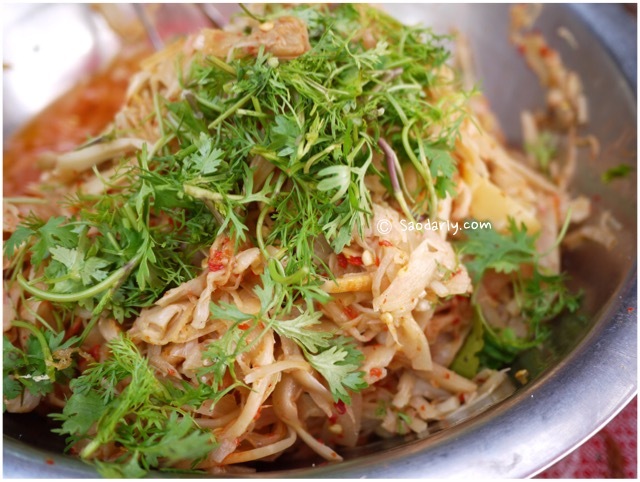 Aunt Kian and Aunt Phone are fond of Jeow Nor Mai Som (ແຈ່ວໜໍ່ໄມ້ສົ້ມ, แจ่วหน่อไม้ส้ม, แจ่วหน่อไม้ดอง) and would usually make two versions of it. One extra spicy for Aunt Kian who can handle the heat and one with a hint of chili pepper for Aunt Phone who has a sensitive stomach. I’ve tasted a couple bites of the Spicy Sour Bamboo Shoot Dipping Sauce as a kid in Vientiane, Laos. I watched my father made the sauce a few times. There was usually grilled fish to go with the dipping sauce. My parents were afraid of my siblings and having an upset stomach due to the sour and spicy nature of the dipping sauce. Therefore, they didn’t allow us to eat this dipping sauce with them as a meal. We were only able to take one small bite as sample and then had to eat the grilled fish with a softer Jeow like Jeow Maak Len (Spicy Tomato Chutney) or with plain soy sauce and fish sauce.